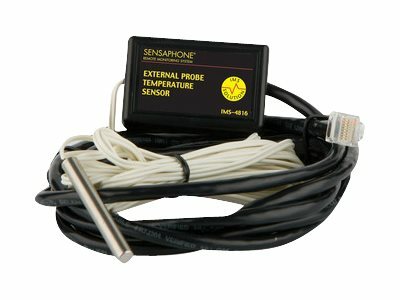 The IMS-4816 temperature sensor with external Probe is designed to connect to the Sensaphone IMS product line and monitor temperatures in areas where a traditional sensor won't fit. The electrical connection between the sensor and IMS unit is made via the attached RJ-45 patch cable. The sensor probe may be secured inside equipment using the included clamp or it may be hung using tie wraps.